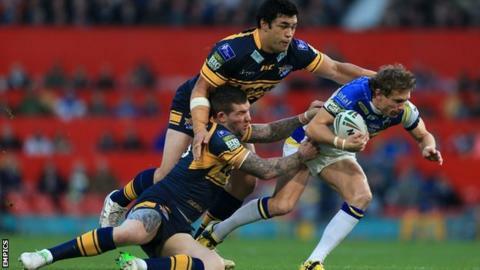 Brett Hodgson insists Warrington can be proud of themselves in 2012, despite not winning a first Super League title. But, after he said: "If you'd have said at the start of the year that we would be in both finals, we would have been pleased with that. "I think we'll improve again next year and I'm looking forward to it already." Hodgson continued: "We've got a great blend of youth and experience here. We'll learn from it. It will make us stronger as a group. "It's too early to talk about whether we'll get there again or not. Next year's a different season. "We're hurting at the moment, but sometimes you just have to put your hand up and say you just weren't good enough." The Australian full-back, who scored a try and five goals to chip in with 14 of Warrington's points at Wembley in August, this time landed just three kicks. But there was an obvious comparison with Rhinos skipper Kevin Sinfield's superb display at Old Trafford. Sinfield matched Hodgson's Wembley haul of a try and five goals at a packed Old Trafford to claim the Harry Sunderland Trophy for man-of-the-match for the second time. And the Leeds skipper did it after recovering from a brutal hit by Michael Monaghan at the start of the second half. The same had happened to Hodgson, who had also needed treatment after a challenge from Brett Delaney six weeks previously before getting up off the floor to help the Wire to a third cup victory in four years. "I don't think there was anything in the tackle. He just slipped into it," said Hodgson. "But Kevin played well. He had a great game. He's excellent at this time of year. "We showed composure in the first half to go in even at half time. But Leeds stayed composed, even when they went behind a couple of times. "We'll look at the game at some stage and learn some valuable lessons."